According to Chinese calendar, 2012 is the Year of Dragon. 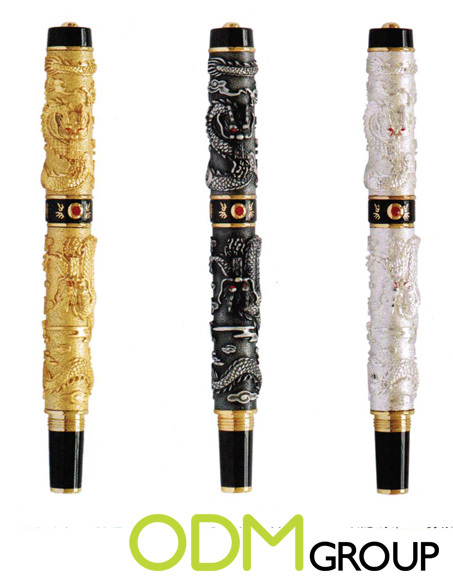 ODM would like to share with you something really special – Dragon Pens for Executives. Spotted at the recent stationary trade fair held at Hong Kong Convention and Exhibition Centre, these pens with extraordinary designs were definitely eye-catching. We like these pens because.. In Eastern context, dragon symbolizes wisdom and power, thus these pens are perfect corporate gifts for executive leaders.Very different from the usual kind of corporate gifts, this unique design can certainly surprise your recipients. Create a lasting and positive impression by making changes to your promo gifts today. Stand out from your competitors by giving away something special like these pens.